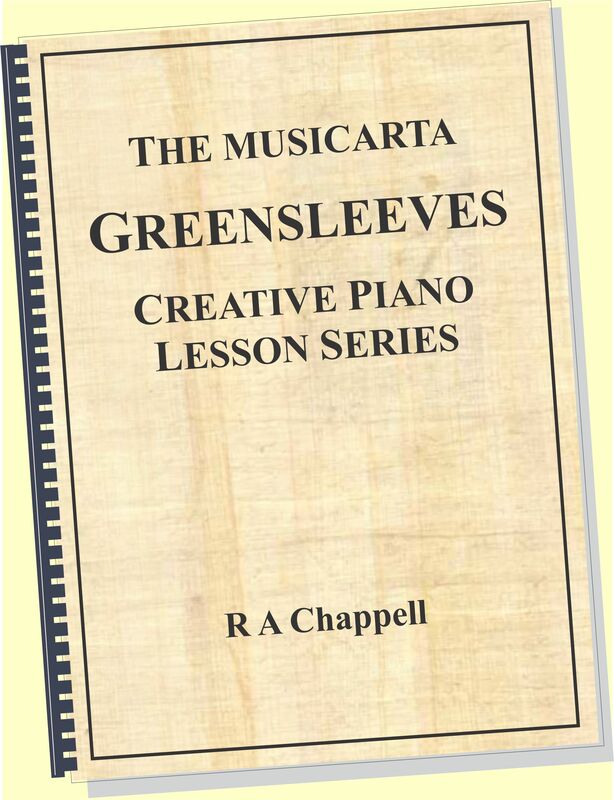 This is the last module in the Musicarta Canon Project transposing mini-series. To get the most out of it, you should have worked through the main Canon Project as far as Module Seven and have finished the other three transposing modules. 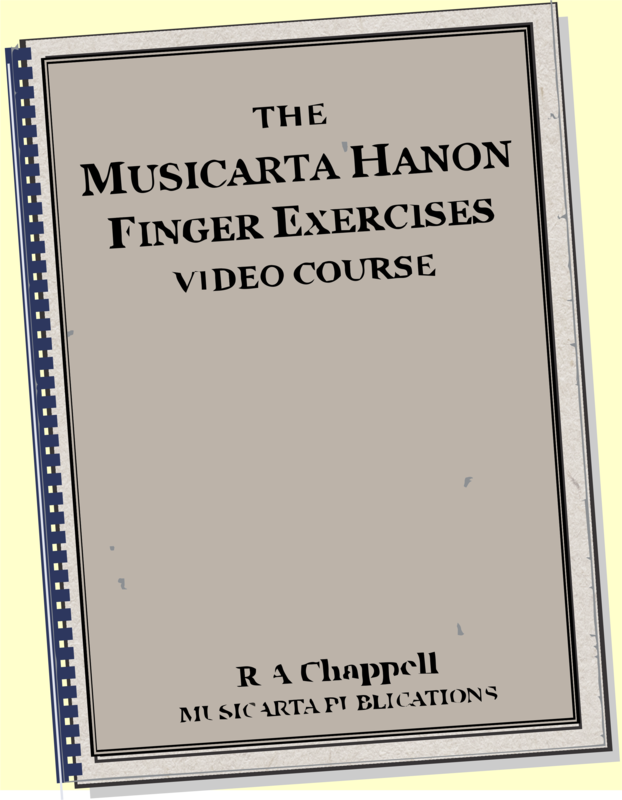 We will use the B strain of Canon Diaries 12-05-12 to devise an exercise which will give you invaluable practice modulating and playing the Canon chord sequence in different keys. The CD 12-05-12 B strain is in F and uses these chords. 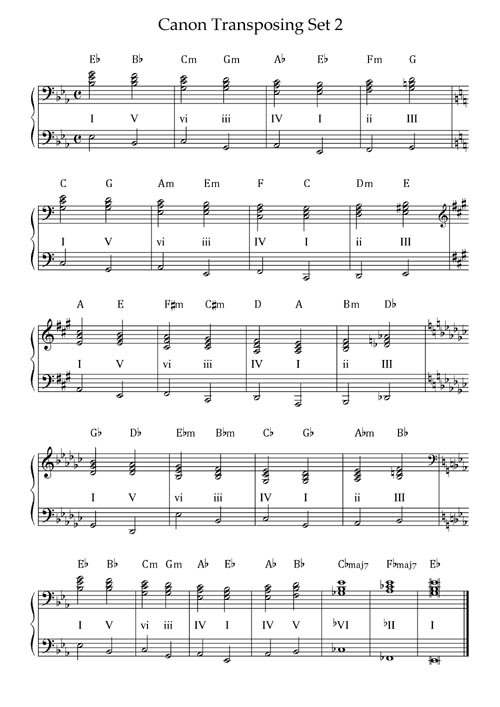 The first six chords are the Canon chord sequence chords in F; the last two are different. 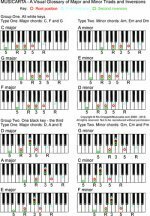 Here are the chords in the Roman numeral system. 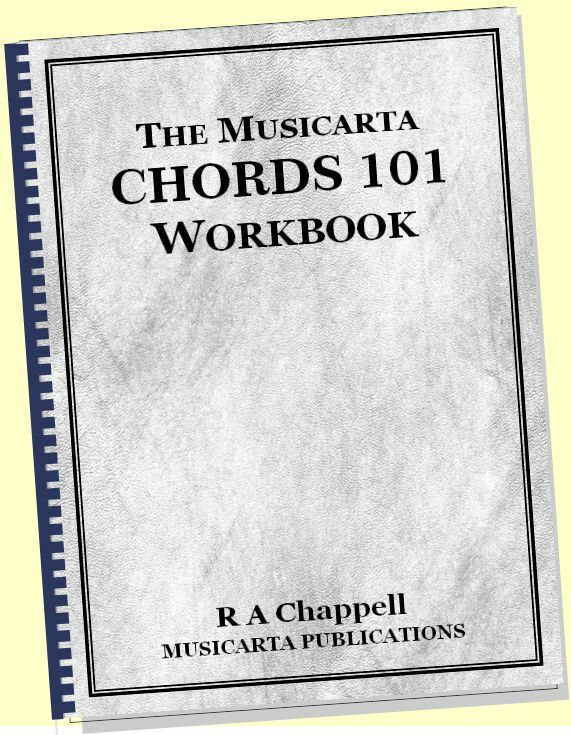 The last two chords go up tunefully from I (F) a whole tone to a minor chord ii (Gm) then up another whole tone to a major chord III (A). 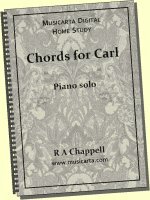 In Canon Diaries 12-05-12, where this chords sequence comes from, this final III chord is the dominant (V) chord that returns us to the home key of D for the final strain. 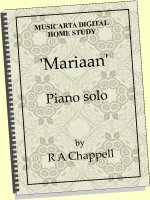 Taken on their own, these last three chords (I-ii-III – F, Gm, A) therefore lower the key by modulating down a minor third (F major down to D). 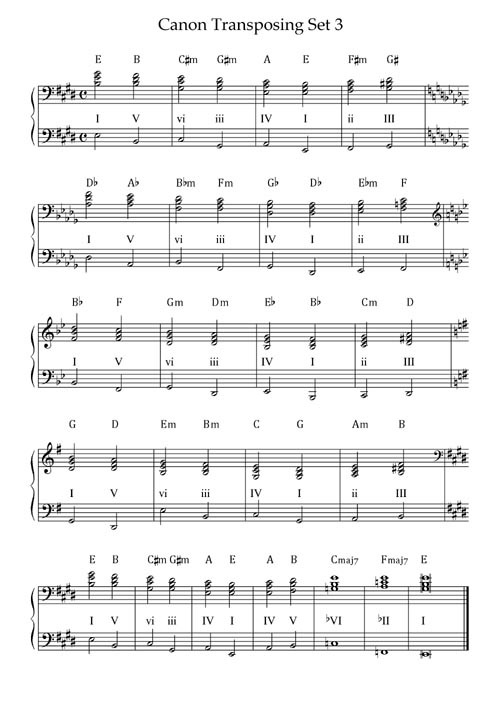 we copy the pattern-in-F above and change the last two chords. 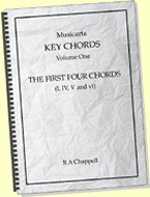 The F#/V chord at the end of the phrase takes us into the key of B, a minor third down from D.
There are four minor thirds intervals to an octave, so if we play this modulating sequence starting in the Canon key of D, we will drop successive minor thirds through B, A¨ and F majors playing the same sequence in each key before returning to D.
Each starting tonic will take you through four keys, so three sets are needed to cover all possible keys. 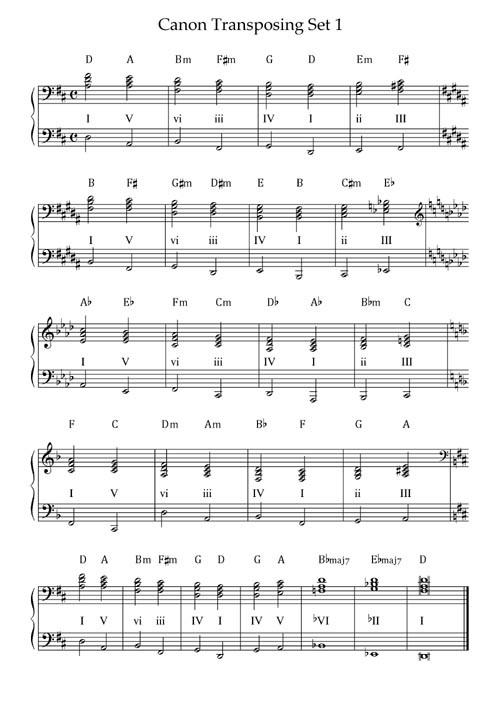 Set 3: Start on E to play E, D¨, B¨, G, E ending Cmaj7, Fmaj7, E.
The music for these three sets is shown below and is in the Workbook. 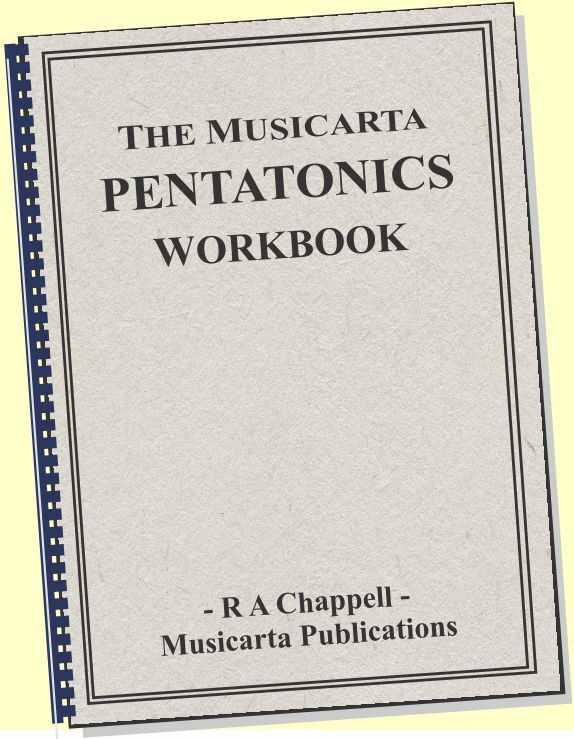 The first chord in each line of music is the tonic for that line - that is the key signature you see. The sets ends with the ¨VImaj7–¨IImaj7–I pattern from Canon Diaries 12-05-12. The overlap shows the modulating chords (E minor and F# major) written in both keys – as ii and III in D, and as iv and V in new key B major. 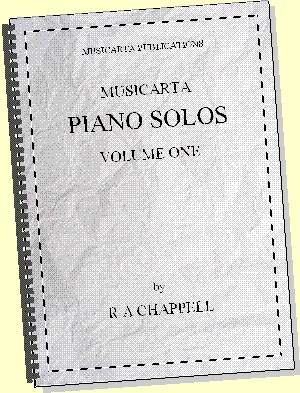 The overlapping chords are called ‘common chords’ or ‘pivot chords’.